These simple, healthy, Asian-inspired recipes have been developed between Lee Kum Kee - the inventors of Oyster sauce - and street food favourites Smokin' Lotus. They are perfect for a healthy summer BBQ and are packed with fragrant Asian flavours. A quick-to-cook fish dish that is packed with umami, perfect served with grilled vegetables. · Asparagus, baby courgettes, tenderstem broccoli, which can all be cooked on the bbq at the same time as the fish. 6. 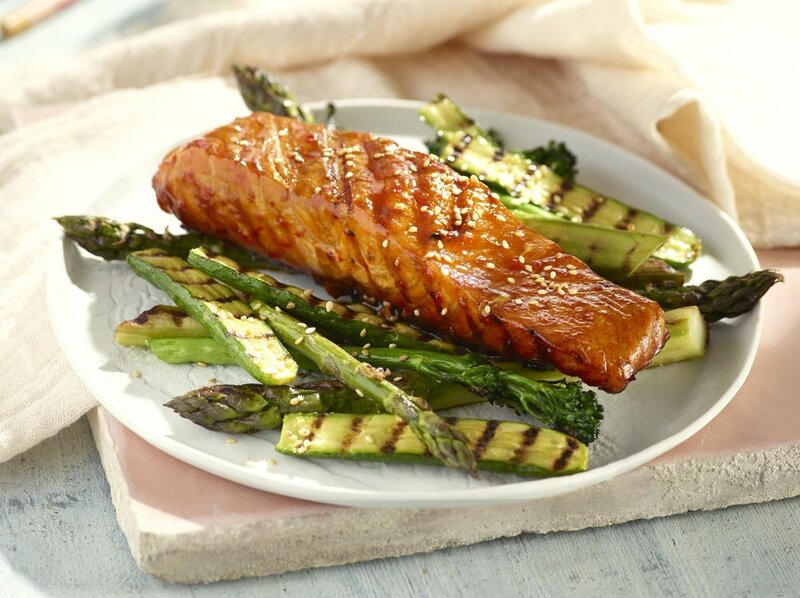 Take the salmon off the grill, brush again with the glaze if wished, and serve immediately with a selection of griddled vegetgables. A delicious, spicy and smoky tofu dish, great as a veggie or vegan burger alternative. 1. Cut the tofu into 1cm slices. Lay a clean tea towel on a board, place the tofu on top then cover with another clean tea towl. Place a second board on top with a weight e.g. cans, and leave for 1 hour. Alternatively use 3-4 pieces of paper towel. 2. In a shallow dish mix all the marinade ingredients together, add the tofu, turn to coat both sides then allow to marinate for 30 minutes or overnight if preferred. 3. To cook, light your BBQ. If you are using charcoal make sure they are fully lit and all the flames have died down. Take the tofu out of the marinade and brush each side with a little oil. Place the tofu on the hottest part of the grill and cook for 2 minutes before turning. Cook on the other side for 2 minutes or until slightly charred. 4. Mix the glaze then brush onto the BBQ tofu slices before serving. Arrange slices of cucumber and mint leaves on the soft buns, adding the bbq tofu and topping with salad leaves. Tip: If it’s not BBQ weather, cook the tofu on a lightly oiled griddle pan. A light, healthy and fragrant noodle dish that will work as a side dish or a tasty vegetarian or vegan summer meal. Tip: For an easier version replace the dressing with 4 tbsp Lee Kum Kee Oriental Sesame Dressing. 1. Cook the noodles according to the pack instructions. Drain, rinse with cold water and drain very well, put into a large bowl. 2. Blanch the sugar snaps in a small pan of boiling water for 1 minute, Drain, plunge into cold water, then drain again. Thinly slice on the diagonal, add to the noodles with the bean sprouts. 3. Wash and cut the cucumber into thin batons or use a julienne tool to make thin strips, add to the bowl with the radish, spring onion and coriander. 5. Turn into a serving dish and scatter over the sesame seeds. Serve with flatbreads and salad.